The linear recursion of "distinction", "dimension", and "ordered class"
I have once again begun studying the fundamentals of semantic ontology and category/classification theory, and am again considering the once-seemingly explosive thesis that it is possible to build the entire semantic structure of classification and all cognitive processes in terms of ONE extremely simple algebraic primitive element -- that element being the concept of "distinction" -- probably understood as a "cut" -- as per the concept of "Dedekind Cut". Years ago, after a ton of work on these ideas, I became persuaded that the entire structure of taxonomy, for example, can be mapped in terms of dimensions, and that all the dimensions in this structure were composed of "distinctions". 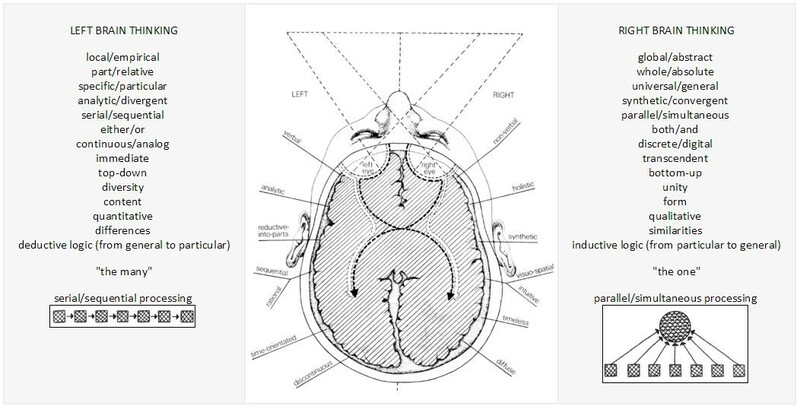 So, this led to the wild and intriguing doctrine that the entire structure of cognition takes the form of "a cut on a cut on a cut on a cut on a cut" (ie, descending levels of specificity in a cascade like a taxonomy). It feels like I am going to push this hard for a little while, so I might stick my deep confusions or accelerating enthusiasm into this framework. Thanks John, thanks all. 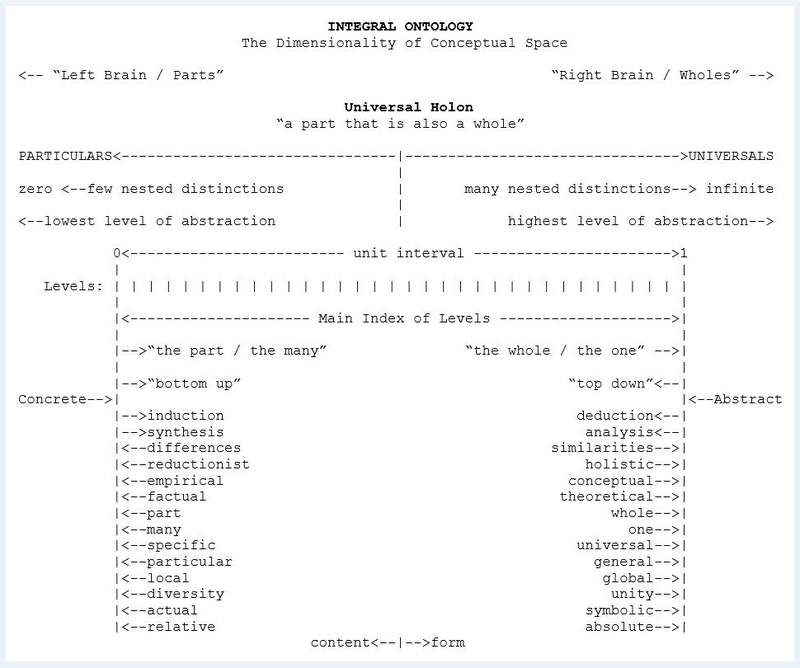 And here's the same idea defined strictly as the polar ends ("lowest" and "highest") of a hierarchical spectrum of abstraction -- shown here as the tension between "parts" and "wholes" -- or between "reductionism" and "holism". Does "all logic" really run across this single spectrum? If it does, why isn't this more obvious to everybody? If it doesn't, what is wrong with this model? This discussion was posted in the "Technical" section. But that section is for discussions having to do with technical aspects of running of the Azimuth Wiki and Forum - problems with the software, problems with spam, etcetera. I have moved this discussion to somewhere more appropriate: "General". Comment Source:This discussion was posted in the "Technical" section. But that section is for discussions having to do with technical aspects of running of the Azimuth Wiki and Forum - problems with the software, problems with spam, etcetera. I have moved this discussion to somewhere more appropriate: "General". Thanks for putting this discussion in the right place. Just a tiny question or thought: has anyone explored the algebraic idea of a "cut on a cut" as per "Dedekind cut"? A Cartesian coordinate frame is usually defined in the X and Y axes in real numbers, and the Dedekind cut might be defined in the X axis somewhere, perhaps as the square root of 2. What if the origin was defined by the X axis being a Dedekind cut in Y and the Y axis being a Dedekind cut in X? Is this completely obvious or trivial -- or wrong headed? It seems possible to explore a bunch of interesting things in this way, by seeing the lowest level of decimal point as defining the unit interval, shown in this graphic as the range from 1 to 2. "Not as a continuous, infinitely divisible quantity, but as a discrete quantity composed of an integral number of finite equal parts"